Join the discussion on our forums! Come discuss Blast Wave over in our dedicated Blast Wave discussion topic. With Celestial Emissary it's basically a Sprint without fatigue + Flamestrike that also damages your own minions if your opponent has a lot of minions out (zoolock, Lesser Emerald Spellstone, odd paladin, etc), and possibly with more draw. Really good in the right decks. Celestial Emissary might be pretty niche (not sure, I don't keep up with the meta) but they're worth having in Dragon's Fury/AoE centric decks where the casting cost of Cosmic Anomaly is prohibitive. And as a bonus you get a free draw when Celestial Emissary dies, effectively negating the card disadvantage from playing it. Sadly can't use the combo with Baku the Mooneater where it would really shine, and the only spell damage minion you have in that deck is Black Cat who won't proc the overkill themselves. Last ditch effort to bring back Quest Mage before the quests rotate out next year. Never been a favorite deck of mine. Good card in that archetype but 'meh' otherwise. I don't see the point of building my deck around a card that only works against board centric decks and just floods my hand with random spells. Surely you can have a lot of fun with this, but how does it win you the game? Dude. This deck already exists, it is called Big mage, and it wins by drawing Jaina. I will gladly put 1 copy in mine, just for value. Bloodmage Thalnos, Celestial Emissary, meet your new best friend. Alternate card text: If your opponent is playing Odd Paladin, destroy his board and add 3 copies of Blizzard to your hand. Good card which will see play if the meta is right (pirates). I read it once again and started to wonder if Overkill can be activated multiple times... Because if yes, that card might actually more decent than I gave it credit for. I don't think it would even be good at 4 mana. For the effect to trigger you need to hit a 1 health minion, which achieves the same effect as using a 2 mana Arcane Explosion. I am trying not to judge cards for Odd/Even decks at first. Trying to see a card for "normal" deck at first, after that I am looking on them in perspective of Odd/Even. I believe that Genn and Baku broke the community a little bit. Yes, it can be activated multiple times. Ooooh, interesting idea, Overkill on an AoE effect. AoE in general tends to overkill most of the time. 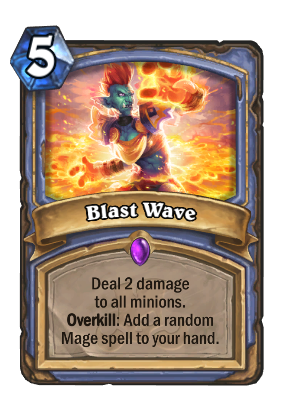 Balance wise, I think it's much too expensive since you're paying 2 extra mana from Volcanic Potion for a chance to get a random mage spell. Which guaranteed is otherwise costed at < 1 mana. EDIT: Ah, it can indeed trigger multiple times. This is gonna be absolute bonkers in arena with the abundance of tokens. The existence of Violet Wurm alone makes this an insane arena card. It isn't really that easy to overkill something using 2 damage only. This might get you multiple spells vs Odd Paladins sometimes but that just about it. Works well with Cosmic Anomaly, at the very least. At 2 mana more than Volcanic Potion it kinda stings, but if you can get two random spells off of it, it'll be well worth it.